This large land and populated state borders Lake Michigan and has served as major transportation and commerce centers for many years. The Native Indians of this area were Illini, a political alliance among several tribes, referred to as the Illinois Conference. There were about 25,000 Illinois Indians in 1700. However, the warfare with the Iroquois league of tribes brought the Illinois Indian population down to 2,500. Other Indian tribes; like Potawatomi, Miami and Sauk moved from the east into the Illinois region. It was French explorers who first arrived in Illinois around 1673. By 1680 a few forts were built along major rivers. The French influence continued until 1763 when France had to turn the land over to England. The many small French settlements did remain and just a few British soldiers were posted in Illinois. It would be George Rogers Clark who claimed Illinois for Virginia in 1778 after the colonies were at war with England. By 1783 Virginia ceded the land to the new United States and the Illinois region became part of the Northwest Territory. Not until 1809 was the Illinois Territory created and then statehood granted on December 3, 1818. Before Illinois was a territory there was some slave labor. In 1818 when it became a state, slavery was banned. The city of Chicago located on Lake Michigan was important in trade beginning back in the 1840s. It later became a hub for the railroad system. In 1800 the number of frontier settlers in all of Illinois numbered 2,458. Fifty years later that number climbed to 851,470. Another fifty years showed the state had become very popular area with 4,821,550 residents. For Illinois genealogy, examining the increase in population and during which years help explain it economic growth. In the 1830s a major religious group, the Mormons had settled in Illinois, beginning with nearly 12,000 residents. The town of Nauvoo was developed. After their leader, Joseph Smith’s death in 1844, most of the Mormons headed to the Utah area with a few remaining in Illinois. Illinois supported the Union cause during the American Civil War with the state sending some 250,000 soldiers. Many freed African-Americans came to Illinois after the war. In the 1870s the state’s economic base increased with industry and farming. From the late 1800s and into the 20th century many immigrates came to Illinois and especially to the Chicago area. Vast groups of Germans, Irish, Poles and Italians emigrated from their homelands for Illinois. The state’s population in 2009 is 12.9 million. Approximately 13.8 percent of the present population is foreign born. That same situation has been in place for decades. The largest group of immigrates in Illinois now are originally from Latin American countries, roughly 48 percent. Next would be those from Asian nations, making up 23 percent. Overall, within the total population, approximately 63 percent are white, 15 percent African-Americans and 15 percent from Latin American cultures. 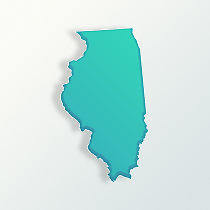 The Catholics and Protestants are the largest religious groups in Illinois.